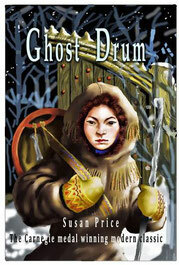 The first book, The Ghost Drum, won the Carnegie medal. It grew slowly over a long time. Since the age of eleven, when I first collided with the Norse Myths, I've read lots of folk-lore and mythology. I particuarly loved some of the epic Russian fairy tales, which seem to have drawn many motifs from Norse Myth. Of course, the Russian city of Kiev was founded by Viking traders. I come from a family of artists and used to draw and paint a lot myself, so when I discovered the beautiful illustrations of Bilibin, they became another influence. And I had a Polish uncle, who told me about the bitter winters of Poland. In his house, I saw Polish ornaments and books illustrated with woodcuts. It all fed my imagination. Above: one of the richly coloured and patterned illustrations by Bilibin, for Pushkin's Tale of Tsar Saltan. I kept a book of Bilibin's illustrations to hand while I was working on The Ghost Drum, for inspiration. It all came together in my head, and produced The Ghost Drum. The first impulse to write it came with a visual image. It was almost as if someone handed me a postcard and said, 'Write about this.' On the 'postcard' was a picture of a glittering, snow-covered landscape, with a black, star-filled sky above it. At the centre was a turretted building, with each tower topped by a coloured onion dome. As in a dream, I knew that inside one of those domes, at the top of a tower, was a prisoner who had been born in there, and had never seen outside. I knew I wanted a witch to be his rescuer. I knew I wanted the story to be full of ice, darkness and the brilliant jewel-colours of Russian folk-art. I wanted the book to be as beautiful as it was frightening. I remember 'writing' the opening passage in my head for something like a month. Wherever I was, whatever I was doing, I ran the words through my head and memorising them. I concentrated hard on visualising the arctic landscape and finding the closest fit for it in words. In a place far distant from where you are now grows an oak-tree by a lake. My story is set (says the cat) in a far-away Czardom, where the winter is a cold half-year of darkness. In that country the snow falls deep and lies long, lies and freezes until bears can walk on its thick crust of ice. The ice glitters on the snow like white stars in a white sky! long night, and all that long night long, the sky-stars glisten in their darkness, and the snow-stars glitter in their whiteness, and between the two there hangs a shivering curtain of cold twilight. In winters there, the cold is so fierce the frost can be heard crackling and snapping as it travels through the air. The snow is so deep that the houses are half-buried in it, and the frost so hard that it grips the houses and squeezes them till they crack. How did you feel when it won the Carnegie? Puzzled! 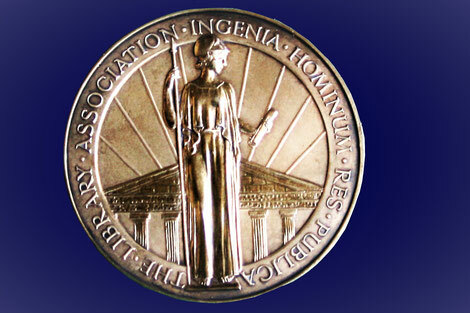 I didn't know it had been entered for the Carnegie and I didn't follow awards. Still don't. The first I knew of it was when I had a phone-call congratulating me on being on the short-list. I hadn't known I was on the long-list. I asked what other books were on the short list and was told it was the longest short-list there'd been for years and it was a heavy-hitting one. I immediately dismissed any idea of winning the medal and forgot about it. Months later -- when I really had forgotten all about it -- I was phoned with the news that The Ghost Drum had won. I don't know whether my mother or my publishers were more thrilled. Because of winning the Carnegie, it was translated into Japanese -- and, I gather, is going to be re-issued as an e-book in Japan. It's also been translated into Danish. And there are two other books in the sequence? There are four now. The fourth, Ghost Spell, is self-published. The other two books are Ghost Song and Ghost Dance. Tell us about Ghost Song. Well, The Ghost Drum begins on the longest mid-winter night, when there is no daylight. A 'night-visiting' female witch comes and demands a new-born baby girl from its mother. Almost as soon as I'd finished the book, I started thinking: What if a male witch came on midsummer night, when there is no darkness, and demanded a new-born baby boy from his father? I started by wanting it to be an entirely separate book but I couldn't make it work until I took the villainous male witch from The Ghost Drum, and made Ghost Song his story, at least in part. 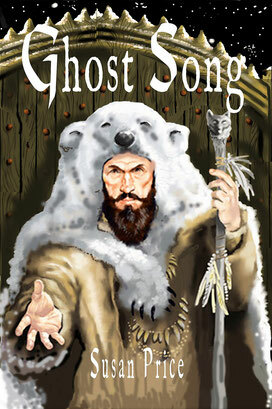 I've always said, when asked, that The Ghost Drum is my best book, but when I re-read Ghost Song, in order to self-publish it, I came to conclusion that Song is better. That's only my opinion, of course, but I felt that Song was more complex, more intense and poetic than The Ghost Drum. Drum and Song were written one after the other, with hardly a pause. Ghost Dance was written some time later. I'd always wanted the mad Czar to be a bigger character in The Ghost Drum than he is, but it didn't work out. The Czar died quite early in the book and his sister, the Czaritsa Margaretta stepped up to take the villain's place. So there was unfinished business there, with mad czars. 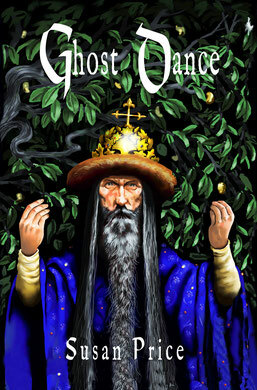 Ghost Dance stands entirely alone from the first two books though it is set in the same world, and has shamans, shape-shifting and magic. A truly barking mad czar is one of the main characters. On re-reading it again, when I self-published it, I thought, again, that it might well be better than The Ghost Drum. It's certainly much more sinister. It's set in a harsh, cynical, dangerous world -- though there are flashes of hope and kindness. 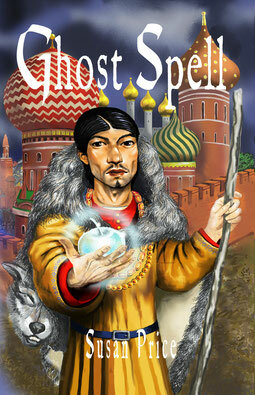 What can you tell us about the fourth book, Ghost Spell? Again, it's set in the same world, but it's much more romantic. At its centre are two lovers: Vulchanok and Kristiana. As he grows, the wolf-shaman enters his dreams and teaches him the roads to the Ghost World. So he becomes a shaman, but the villagers begin to fear and distrust him. Kristiana has quite a different life. She lives far to the south of Vulchanok, in a great northern city. She's an orphan and a noblewoman of sorts and lives hidden away in the Czar's palace. A noblewoman was not supposed to be seen outside her home. So while her brother, Glev, wanders the city every day, trying to find her a husband, she stays in their tiny apartment, reading. But the course of true love never did run smooth -- and nor does it here. Any plans for another book in the series? Not at the moment. I think four is probably enough.